The number of homes taken to auction across the capital cities has fallen for the 4th week in a row, with just 1,612 auctions held this week, down from 1,766 last week, although higher than this time last year when 1,391 properties went under the hammer. The combined capital city preliminary clearance rate increased to 72.4 per cent this week, up from the final clearance rate of 68.4 per cent last week, although this will revise as more results are collected. The final clearance rate has nudged slightly higher over the last two weeks after reaching a year to date low of 66.5 per cent; it will be interesting to see if this is still the case on Thursday when the final figures are released. Adelaide and Brisbane were the only cities to see a slight increase in auction volumes this week, while Melbourne had the highest number of auctions scheduled (753). 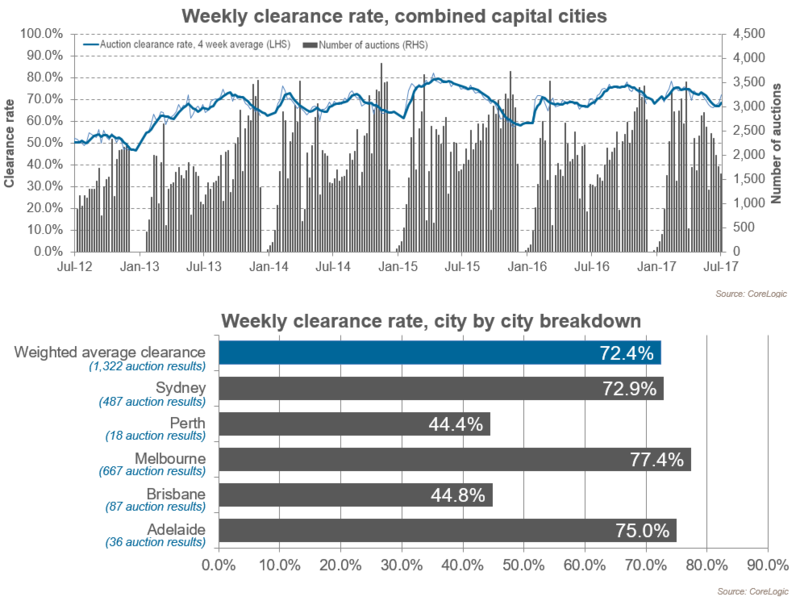 In terms of preliminary clearance rates, Melbourne was the best performing city with 77.4 per cent of the 667 results recording a successful result, and although this result will revise lower as the final results are collected, it is likely to be stronger than what we have seen in Melbourne over the last month. Across Melbourne, 77.4 per cent of the 667 reported auctions sold this week. There were 753 auctions held across the city this week, falling from 818 last week when the final clearance rate was 72.9 per cent, but higher than one year ago when 667 homes went to auction and a clearance rate of 76.1 per cent was recorded. The West region of Melbourne had the highest number of auctions this week (138), with a preliminary clearance rate of 68.8 per cent. Meanwhile, the strongest clearance rate was recorded across the Outer East, with 90.9 per cent of the 55 reported auctions clearing, followed by the South East region with a clearance rate of 86.2 per cent. In Sydney, 600 properties were taken to auction this week with a preliminary clearance rate of 72.9 per cent, increasing from last week, when the final clearance rate for the city was 68.6 per cent across 656 auctions. One year ago, 470 Sydney homes were taken to auction and the clearance rate was 74.9 per cent. Looking at the sub-regions of Sydney, the Baulkham Hills and Hawkesbury region recorded the strongest clearance rate of 94.1 per cent across 21 auctions, followed by the Eastern Suburbs (84.2 per cent), while the North Sydney and Hornsby region had the highest volume of auctions (84), and recorded a clearance rate of 76.9 per cent. There were 116 Brisbane homes taken to auction this week, with 87 results reported so far. The preliminary clearance rate for the city is 44.8 per cent, down from 55.7 per cent last week and lower than one year ago, when 47.0 per cent of the 120 properties taken to auction were successful. Across the Gold Coast 14 results have been reported so far, with a success rate of 64.3 per cent. This week, Adelaide saw a preliminary clearance rate of 75.0 per cent, with 36 reported results across a total of 65 scheduled auctions. In comparison, over the previous week Adelaide’s clearance rate was 59.6 per cent and 54.7 per cent one year ago. There were 33 Perth auctions this week and so far 18 results have been reported, with 44.4 per cent selling. Last week 36.4 per cent of the 22 reported auctions were successful. Canberra’s preliminary auction clearance rate of 72.7 per cent across 39 auctions is higher than both last week, when the final auction clearance rate was 62.7 per cent, and last year (63.3 per cent). Tasmania saw 6 auctions take place this week and 5 results have been reported so far, with 3 sales.